Or if one of them cannot read French. I'm not 100% completely absolutely sure this is a perfume site, but it does have words like Eau De, and Fragrance. And it's hot in a soft, feminine way, which screams (or rather giggles) perfume to me. HA. There's an english version to the site. Here I thought I was peeking into the bedroom of a french girl. God, that sounds bad. *cough. 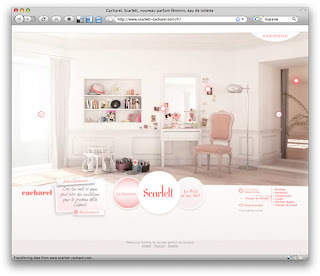 Ok.
With no real prompt or introduction, the Scarlett site places you in the middle of a woman/girl's boudoir. While their target is obviously very focused, I couldn't help being a bit drawn in. The tiny dots around the room bring up soft fluid glimpses into this persons (your) life. Arrows on either side bring all portions of the room into view. In addition to the bedroom is the "Wall of My Life". 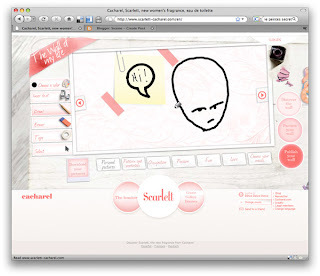 It's basically a scrap-booking app, to upload photos (which you can add tape too), or create your own images with the drawing tools. Nowhere in this is there an Ad for the perfume. You do not make a wall that is an ad for this product. If you happened to have read the last two posts, I swear I didn't set this up. 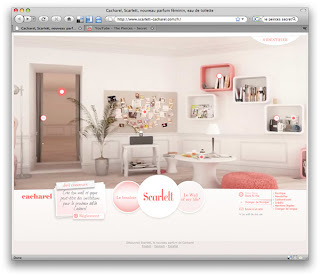 Where the last two sites were self-involved, this one is you-centered. The former made it plain that it was about the brand, the latter about me. When the other sites use CTA's like "Discover" and "Experience", this one embodies both those actions and leaves the rest to you. Heavy Petting #3: Pets or Food?